Whether you prefer baitcasting, spinning or fly fishing, and whether you�re setting out for the ocean, lakes or rivers, G. Loomis has a fishing rod that will perfectly suit you. Renowned for their strength and sensitivity, these rods can handle just about anything with fins, from salmon and steelhead in the Pacific Northwest, to rainbow trout in the Rockies, to stripers in the suds of the Northeast. At TackleDirect, we carry a big variety of G. Loomis rods that will fit any fishing situation, as well as a variety of G. Loomis T-shirts, hoodies and apparel that will keep you comfortable and looking good in almost any weather. Call us toll free for expert advice or send us an email if you have any questions. 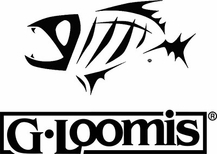 G-Loomis GLX Spin Jig Rods 6'6" - 7'10"
G-Loomis GL3 Spin Jig Rods 6'6" - 7'10"